Note: Equilox I 150 ml Stubbie Cartridge fits into regular caulking gun. Recommend Large Applicator Mixing Tips. Also requires a stubbie adapter with the regular caulking gun. 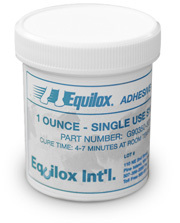 Note: Equilox I Gold 14 oz. Side-by-Side Cartridge requires Gold Side-by-Side Dispensing Gun. Recommend Large Applicator Mixing Tips. Note: Equilox I 420 ml Cartridge requires Equilox Dispensing Gun. Recommend Large Applicator Mixing Tips. Call (507-356-2255) Next Day, 2nd Day Or 3 Day Select Delivery or International Orders - 507-356-2255. PLEASE CALL (507-356-2255) FOR ORDERS IN HAWAII, ALASKA, PUERTO RICO OR INTERNATIONAL ORDERS.